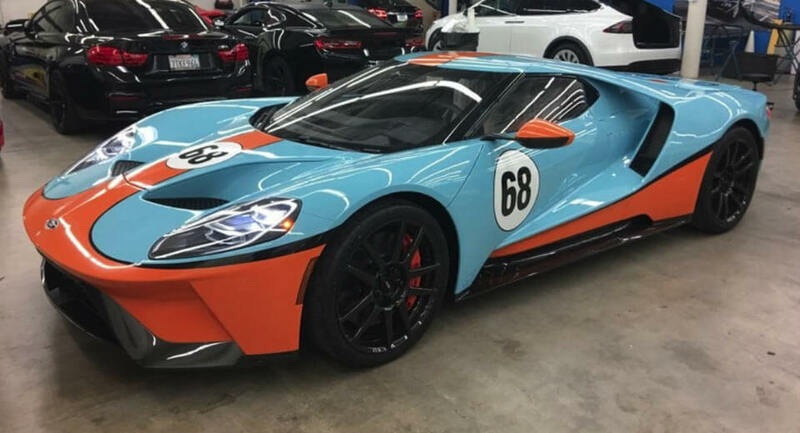 Just when you thought the bright green and blue 2017 Ford GTs were the epitome of bold, we’ve stumbled upon images of a new GT with a retro Gulf Racing livery. A handful of original Ford GT40s once raced with the iconic blue and orange Gulf Racing livery and in 2006, the automaker unveiled the Ford GT Heritage Edition, complete with the same livery and restricted to just 343 examples worldwide. As it stands, the 2017 Ford GT has yet to release a limited-edition variant available in a Gulf Racing livery. Not dissuaded by this, a brave customer headed to Protective Film Solutions in the U.S. to have a bespoke wrap applied. For the most part, the livery closely mimics what was found on the ’06 GT Heritage Edition. Consequently, the front bumper is orange and there is an orange strip running down the center of the supercar. The orange elements are then contrasted by baby blue and the number 68 has been applied to the hood and both doors. Ford has so far celebrated both its 1966 GT40 and 1967 GT40 with special Heritage Edition versions of the 2017 and 2018 GT respectively. While they’re cool, they’re no match for this one-off.